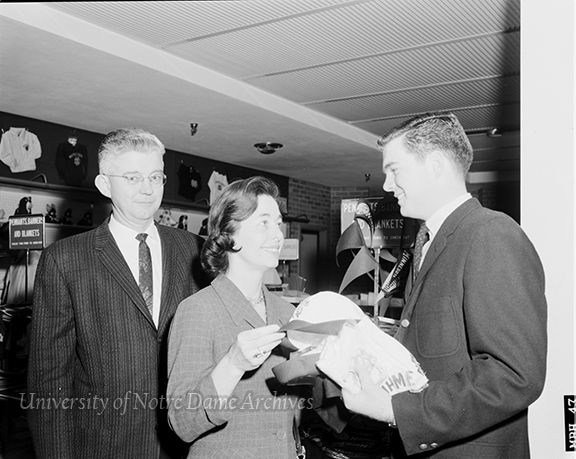 Notre Dame’s Junior Parents Weekend (JPW) first began as Parents-Son Day on April 18, 1953. 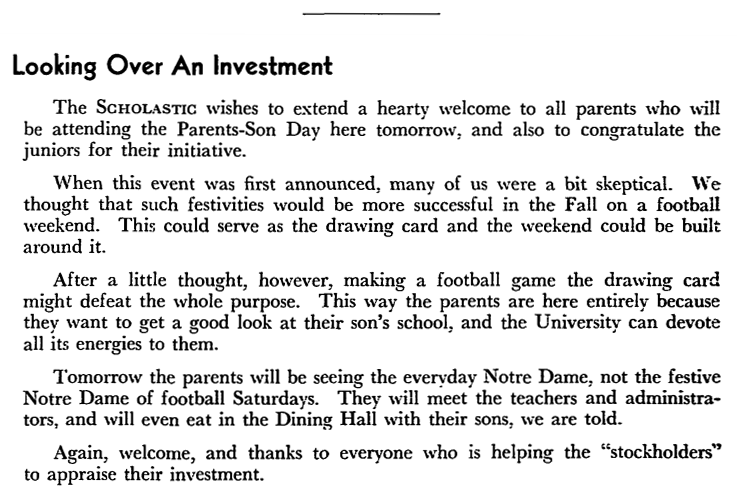 As Scholastic reported, Parents-Son Day was “[a] joint project of the Junior Class and the University administration … designed to ‘better acquaint students’ parents with the everyday life their sons lead on campus,’ [Thomas W.] Carroll [Department of Public Relations] said” [Scholastic, February 20, 1953]. University President Rev. 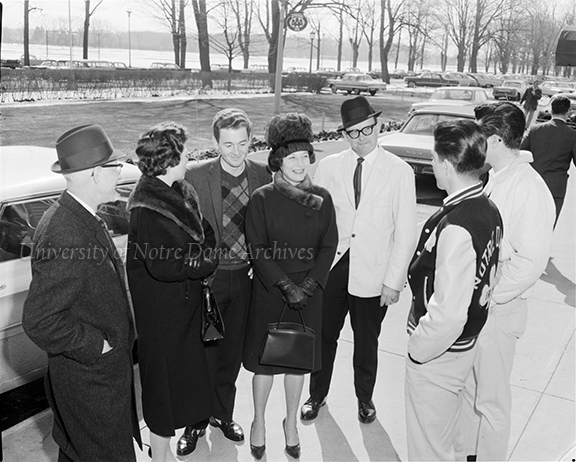 Theodore M. Hesburgh planning the first Parents-Son Day (Junior Parents Weekend (JPW)) for April 1953 with Junior Class Officers Jim Richards and Joe Springer, c1952. Students took their parents on tours of campus, classrooms, and laboratories, meeting faculty and administrators. They ate in South Dining Hall, played golf, and stayed at the newly opened Morris Inn. The day was an immediate success that turned into a weekend-long affair the next year and all the years that followed. Some questioned the scheduled April date as opposed to a football weekend when more parents might likely be in town. 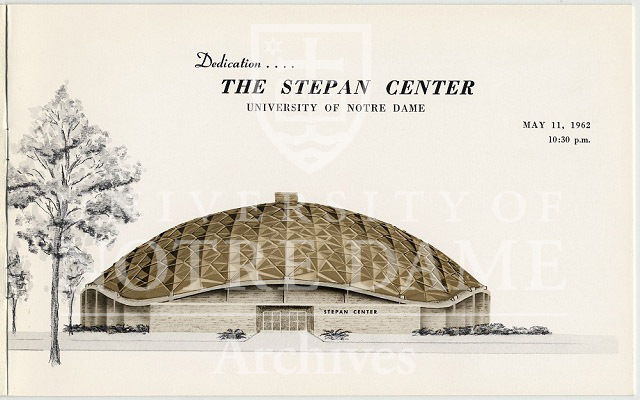 However, the chaos of gameday makes it difficult for parents to see everyday student life at Notre Dame. A special weekend just for the parents in the spring semester has worked out nicely for well over half a century. 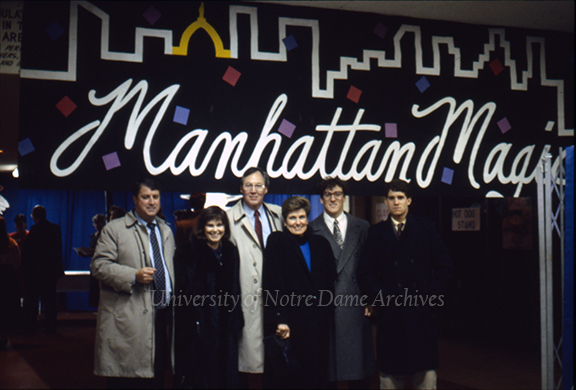 The date of Junior Parents Weekend crept earlier and earlier until it settled in on a mid-February weekend in the 1970s, much to the chagrin of parents hailing from warmer climates than South Bend. Anecdotally, if the harsh February weather is going to break, it likely happens during JPW. In 2017, the temperature will break 60° and the sun will make a rare appearance, dispersing the permacloud and belying the students’ complaints of cold, snow, and the stinging Indiana winds. 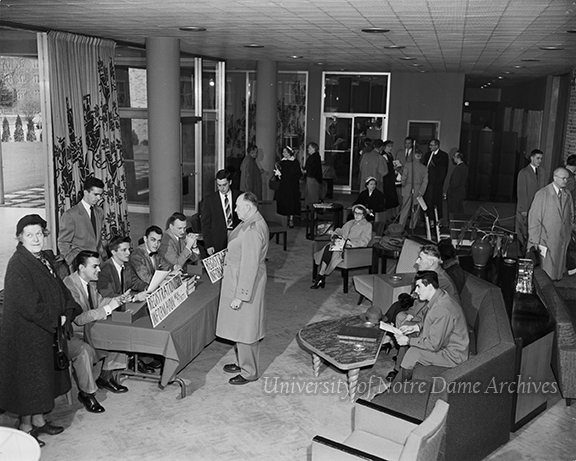 Parents-Son Day – Parents registering at the Morris Inn, 04/18/1953. 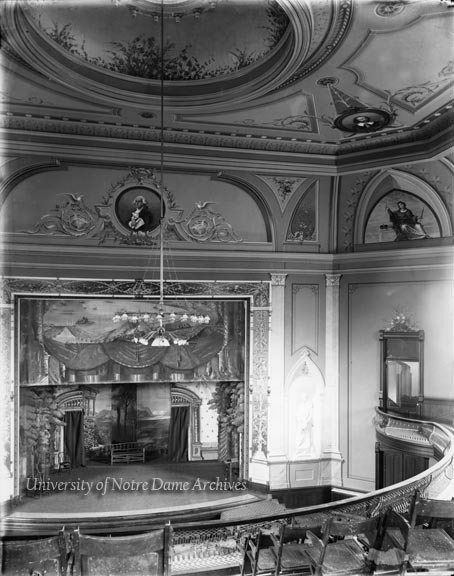 While the Juniors are occupied entertaining their parents on campus for the weekend, there are few other events going on for the other Notre Dame students. In the 1980s and 1990s, the Sophomore class turned this lull into an opportunity to take a road trip to Chicago. Photo by Jack Janowski. 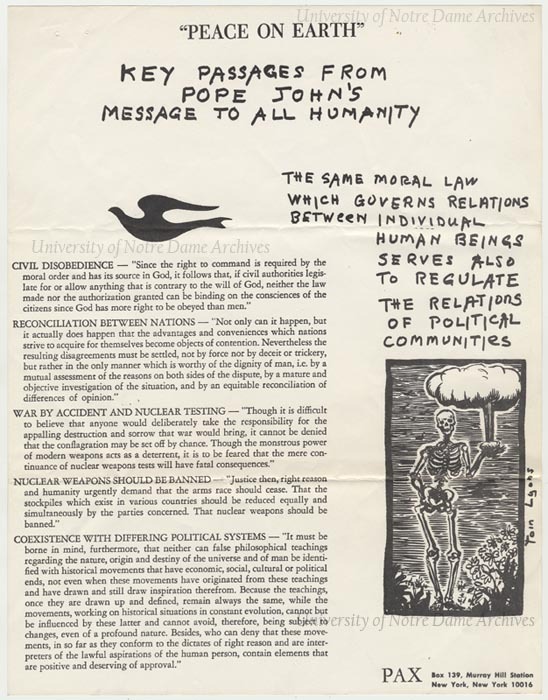 This photo was published in Notre Dame: A Magazine, Summer 1963. JPW has changed little over the years. It still is a time where parents visit their children, meet their friends, tour campus and new facilities, meet faculty and administration, and maybe buy a few things at the Bookstore. The dinners have become more formal and more elegant than the in early JPW years, but the purpose remains the same. In addressing the parents at the first Parents-Son Day, University President Rev. 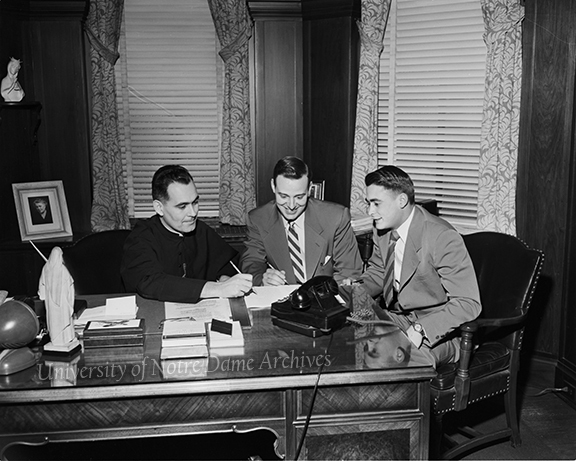 Theodore M. Hesburgh welcomed them to the Notre Dame Family: “‘I want you parents to feel you belong here at Notre Dame as your sons are the main part of our University.’ He considered the Parents-Son Day “definitely pointing to the beginning of a tradition'” [Scholastic, April 24, 1953, page 11]. 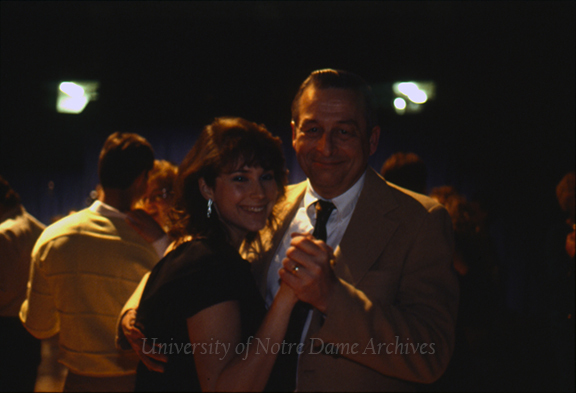 Junior Parents Weekend cocktail party and dance, 02/17/1989.